First of all, an answer to a frequently asked question: No, the haze behind the farmhouse has not been “photoshopped” into the image! 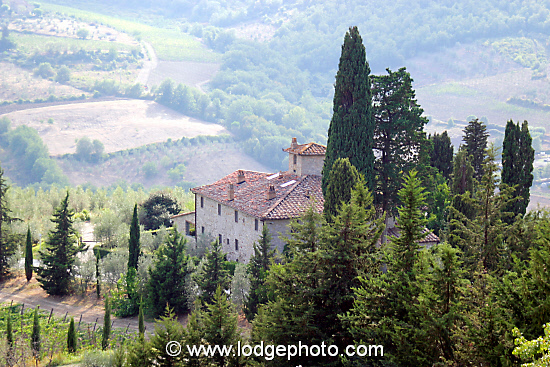 Vignamaggio is a charming Tuscan renaissance villa clinging to the hillside above the town of Greve in Chianti. We first found it while renting a villa a short distance away, further up the road. We saw it was a winery and that was enough by itself for us to stop — but we also knew that Vignamaggio was the location for Kenneth Branagh’s joyous 1993 Shakespeare film adaptation, Much Ado About Nothing. Today, the villa is an upscale B&B and winery and had billed itself as “The Birthplace Of Mona Lisa” until just a few years ago. This leads to second most frequently asked question: is it really, truly the birthplace of Mona Lisa, sitter for perhaps the most famous portrait ever? Well… no, sorry. The literature at the villa claims Lisa Gherardini, the subject of Mona Lisa, was born at Vignamaggio in 1479. There’s just one problem with this: the Gherardinis had sold Vignamaggio 50 years before Lisa was born, and the baptistry records in Florence are clear: she was born and baptised there. There has been intense speculation over the “actual” identity of the model for Leonardo Da Vinci’s painting. Renaissance art historian Vasari states that it was Lisa Giocondo (nee Gherardini) in his “Lives of the artists”. The only problem was that Vasari was writing 30 years after Leonardo’s death, which was enough wiggle room for some to suggest that Vasari was mistaken and that the sitter was Leonardo himself, or Isabella of Aragon, or Leonardo’s mother, or… you get the picture. In 2005, an academic at the University of Heidelberg discovered a note scribbled in the margin of a book that is contemporary with the time of the painting. It positively identifies the sitter as Lisa Giocondo. Lisa was married to a wealthy Florentine silk merchant, Francesco del Giocondo, and this gave rise to the other name of the painting: La Gioconda — also a pun on the jovial expression Leonardo painted. But no matter: today, a visit to Villa Vignamaggio is primarily about wine and/or olive oil, or to stay in its Bed & Breakfast accommodation. The villa’s Mona Lisa Chianti Classico Riserva is excellent, and they also make a range of “Super Tuscans” — wines grown locally that don’t meet the technical criteria to qualify as Chianti Classico. Don’t let that put you off: only wines made almost entirely from Sangiovese can be Chiantis, so a really good Tuscan cabernet has to be called something else! The picture was taken with a long lens late on a summer afternoon looking down from the villa itself. One of the things that makes this picture is the quality of light, a natural gift in that part of the world, which is largely responsible for the saturated color of the tile and stone. The atmospheric conditions common at that time of year (September) cause the haze, making for a pleasing contrast between the foreground and the background. Quality of light is one of the most important ingredients in “available light” photography, and is one reason why waiting for the right light can make a huge difference to a picture. That’s also my excuse for enjoying a leisurely Italian lunch with a glass or two of wine: the light’s too strong! Finally, the long lens is important because it helps to blur the background, improving the contrast and composition.